“She Is…Biblical Reflections on Vocation” is a workbook designed to help people engage questions of vocation through the stories of various biblical women. Each of these women – Lydia, Esther, the Proverbs 31 Woman, Mary, Abigail, and Ruth – demonstrates a faithfulness to God, as God calls them in particular and encouraging ways. This workbook contains a collection of essays, each reflecting on a chosen attribute that captures the author’s lens into these biblical women. These attributes are: she is an innovative woman, she is an activist woman, she is a capable woman, she is a risk-taking woman, she is a peacemaking woman and she is a faithful woman. Together, these attributes paint a powerful biblical image of women in their vocations. You can download “She Is…” as a PDF file. We hope you find encouragement through the stories, wrestle with their challenges and feel free to share the workbook with others. The Philippian church was birthed with the work of prayer by the river. Women worked as they prayed and prayed as they worked. Lydia’s marketplace leadership, partnership in the gospel and faith were intricately connected to the liberating mission being carried out by Paul. No doubt her innovation and determination were an anchor for Paul’s beloved Philippian church. She always was the woman in God’s dream and vision to build up God’s church. The day came for her to go to the king. She put on her best dress, that would remind the king of who she was and the dignity she held. She walked into the room. Her heart pounded. Faith and courage battled fear. If the king didn’t extend his scepter to her, she would lose her life. Would he? In this moment, she did not approach him as his wife or his beloved. She came as the minority-queen-activist – Queen Hadassah-Esther: a Jewish woman of intellect and strategy, of position and power. But, if you have been led to believe that the Bible offers a limited vision of the capability and authority of women, then let Proverbs 31 set you free from this misconception. If you are a woman, let this passage affirm your potential and empower you to use all the gifts God has given you. If you’re a man, don’t just marvel at what women can accomplish. Encourage, affirm, and support the women in your life to be and to do all that God intends for them. Saying yes to the angel Gabriel was a risky response…Mary’s yes to the angel was a sacrificial yes. It was a yes despite her own needs. It was a yes despite what made sense. It was a yes for the sake of others. Abigail’s story so clearly shouts: If you can do something to make peace, do it. Abigail doesn’t have the time to dish out blame or to focus on who is responsible for what. The stakes are high and immediate. She is ready to act, knowing there is a better way than the way Naman and David have taken. Putting herself at risk, she loads up some donkeys and makes things right. She is thoughtful and prudent. She musters up courage, boldness, and wit to make sure the enemies’ swords stay in their sheaths. Abigail acts urgently for peace. What amazes me about Ruth’s story is that God chose a woman who was a widow and an immigrant to be the embodiment of God’s steadfast faithfulness. Neither women, nor widows, nor immigrants had many rights or social capital in the patriarchal society of the ancient Near East. Yet it is through the powerless, the outsider, the unexpected character that God chose to reveal God’s covenantal faithfulness. Illustrations by Sarah Beth Baca. This article is republished from the Oikonomia Network newsletter, with permission from the Oikonomia Network and Fuller Seminary’s De Pree Center for Leadership (www.depree.org). The original article appears here. Visit https://lifeforleaders.depree.org/ to subscribe to the free De Pree Center’s Daily Devotional. 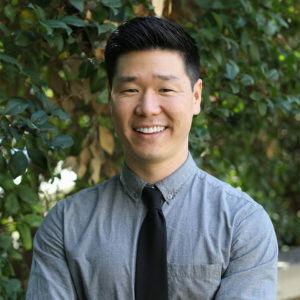 Paul Matsushima joined Fuller Theological Seminary in 2018 as a project manager for the Max De Pree Center for Leadership. He holds an M.A. in Theology from Fuller Seminary and a B.A. in Asian American Studies from San Francisco State University. Before Fuller, Paul was the program manager at Kizuna, a nonprofit organization dedicated to building a future for the Japanese American community through the development of young leaders. He has also served in various capacities in the Asian American faith community, including AAPI Christians for Social Justice and Gardena Valley Baptist Church. Paul and his wife Monica have a son named Marty and a daughter on the way.